Or the Boston Uprising one day rivaling the New England Patriots for prestige? It may seem like a distant, unlikely prospect, but the founders, participants and fans of the Overwatch League eSports dream of it one day becoming a reality. In a relatively short space of time, the league has developed its own stars and legions of followers who follow the tournament either virtually or in person at live events. Launched in January, the 12-team competition comprises franchises representing three continents, with nine teams from the United States and one each from Britain, China and South Korea. The league's models are the major US professional sports leagues such as the National Football League or the National Basketball Association, with a postseason culminating in a July 26-28 grand final where a $1 million prize will be up for grabs. 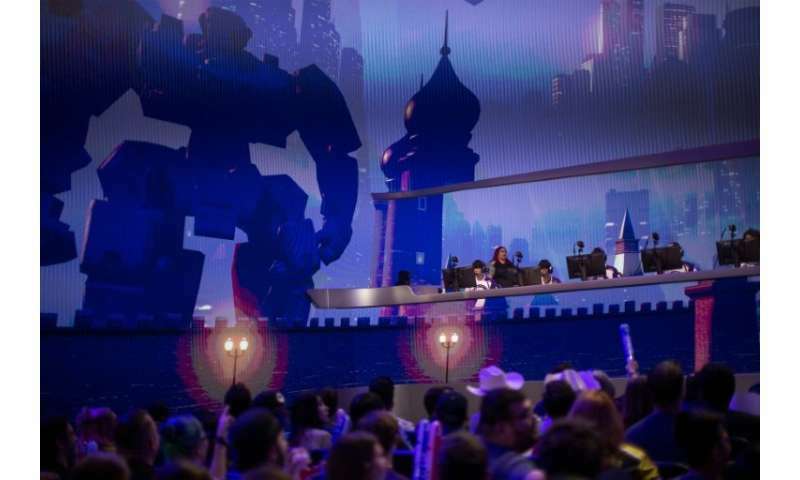 "The business model for the Overwatch League is no different than the business model for any sports league," Nate Nanzer, the league's commissioner, told AFP. "We create content, we put on matches, we put on 12 matches a week, we build an audience around those matches and we monetise that audience through media rights, merchandise, sponsorship, ticket sales, etc." The game was developed by Blizzard Entertainment, the California-based company best known for creating the "World of Warcraft" online phenomenon. The popularity of the Overwatch League can be seen during a screening of a game at the Blizzard Arena in the Los Angeles suburb of Burbank. Hundreds of spectators, some dressed in the colours of their chosen team and others dressed as characters from the game itself crowd into the arena to watch the two six-member teams go head-to-head in the videogame which is shown on a giant overhead screen. In addition to the fans who crowd into the venue to watch live, hundreds of thousands of fans across the United States and the rest of the world watch the action unfold online via the Twitch social media video platform, anxiously following the exploits of players with names like Verbo, sinatraa or Munchkin. "I never considered myself a sport person, I am not a fan of traditional sports (...) I never got why everyone is so into sports," said Alex Parrish, a fan from Houston, Texas. "Being here, I get it. You care about the game, the players, I understand what the feeling is to be a sport person. There is also an element where you feel you are at a theme park, with all those big screens, the beautiful set. When the game starts, it gets you so pumped." The grand plan for the Overwatch League is to create a true global competition, expanding to 28 teams, and featuring regular matches between teams on opposite sides of the world, such as Paris taking on Beijing. "That's something which is unique not only for eSport but for sport," Nanzer says. "There is not a sports league in the world where you have that sort of global competition. It makes sense because Overwatch is a truly global game. "The dream is not a one-off event in a big stadium. The dream is week-in week-out to have millions fans around the world to have the opportunity to engage with this content live. Unsurprisingly, the Overwatch League has already attracted attention from the titans of the traditional US sports league. Robert Kraft, the billionaire owner of the NFL's New England Patriots, and Stan Kroenke, the tycoon whose sports franchises include English Premier League side Arsenal, have reportedly spent around $20 million to create teams. At the sharp end of the competition are the players. Jacob Lyon, 21, who plays simply as "Jake" is one of 130 professional players drawn from 18 nationalities who plays in the league. Lyon has signed a one-year contract guaranteeing him $50,000, with the potential for that to rise through prize money payments from a pool worth $3.5 million. His daily regime resembles that of a conventional athlete, with fitness exercises, training and video analysis. Being healthy is part of being a successful gamer, Lyon said. "With the league structure, when you're playing week on week on week, you have to be able to be consistent and effective over a long period of time," he said. Nanzer, meanwhile, is convinced that eSports are here to stay, brushing off skeptics who question the ability of watching video games being able to appeal to a broad base. "People ask me all the time, 'Oh isn't that crazy that people watch video games?'" he said. "I'm like, 'Isn't it crazy that people watch golf and tennis?' The reason why you watch those things is because you probably also play and you want to see who is the best in the world. It's the same thing here with eSports."